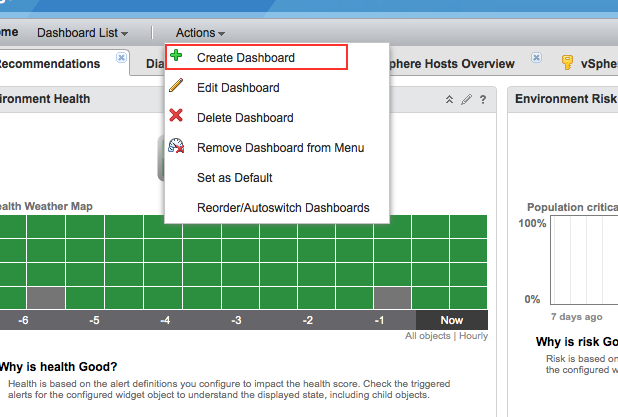 Back in September, I wrote a post about creating custom dashboards with vCenter Operations Manager 5.8. 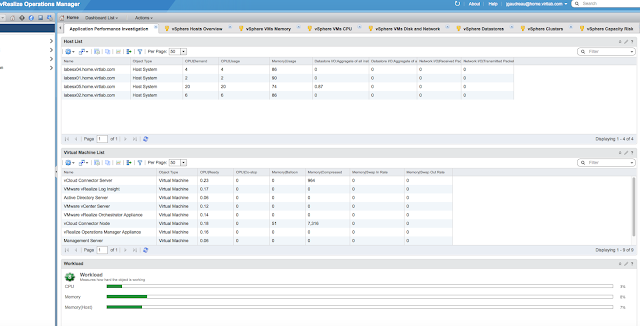 I am going to create a comparable dashboard, again focused on troubleshooting an issue, but with vRealize Operations 6.0. 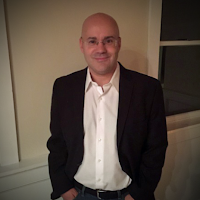 What if you wanted to troubleshoot an application issue that was arising on a regular basis in your production environment? 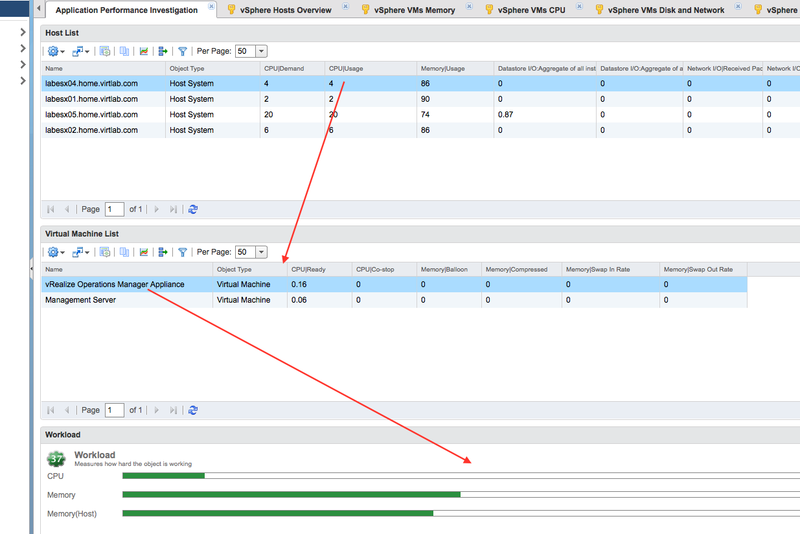 You could create a custom vRealize Operations dashboard that would show the counters you wanted to measure from both a host and a virtual machine perspective. 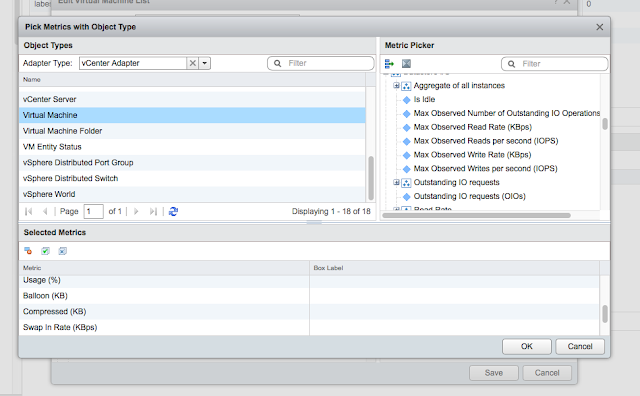 With this type of visibility, you would have all the performance details required when working a major incident call. 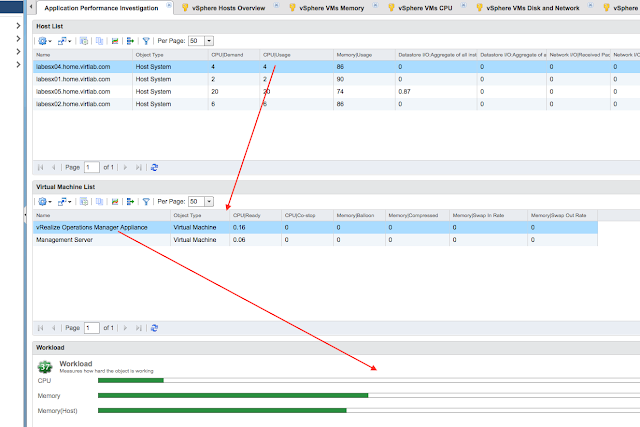 The ability to focus on specific metrics with the granularity possible with vROps provides insight from a current state, historical perspective, and long term trending. Not only can you determine that there is an issue in the environment, but you gain perspective on when it started happening and the long-term impact to the environment if it isn’t fixed. 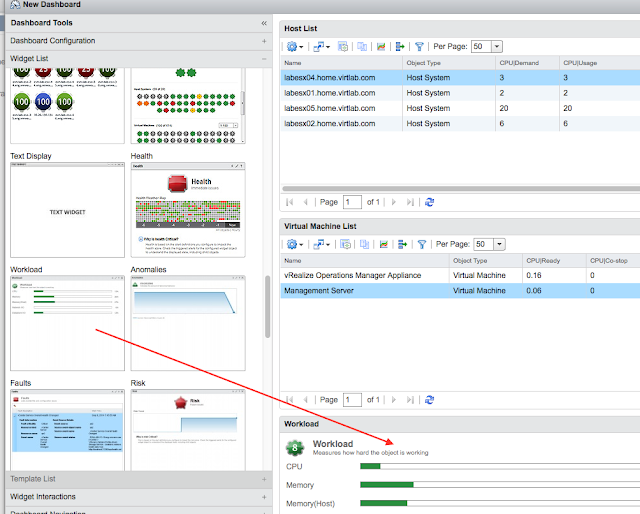 VMware’s patented analytics is the driving force behind this capability. 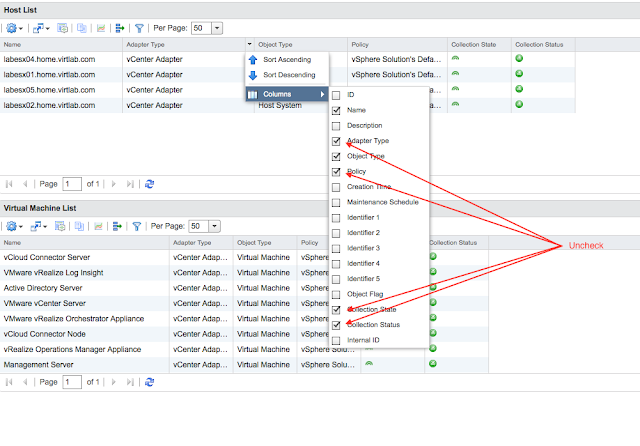 To start with, we are going to launch vRealize Operations Manager. We are going to click Actions and then + Create Dashboard. For our new dashboard, we are going to supply a dashboard name, click No for the Is default, and select the 1 column count layout. This layout is going to present us with a stacked design, which works well with the interactions we are going to establish between the widgets. This makes for a much more dynamic dashboard that helps us drill down into the specifics between hosts and virtual machines. 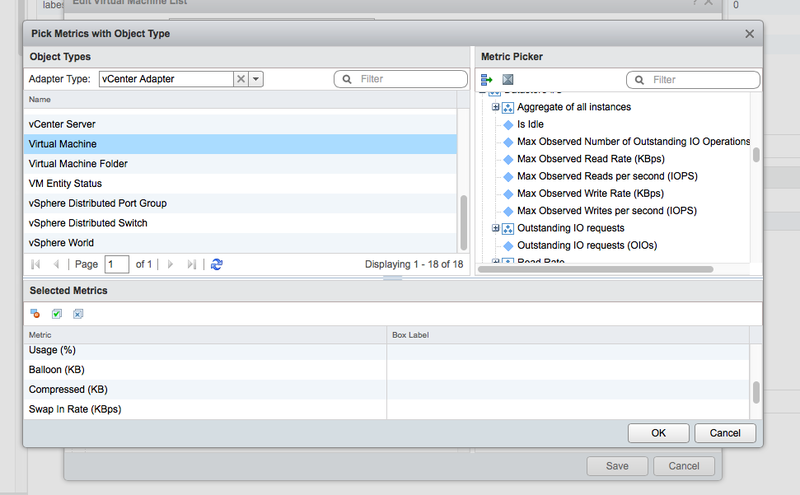 After deciding on our dashboard layout, we are going to drag over two Object List widgets onto our new dashboard. 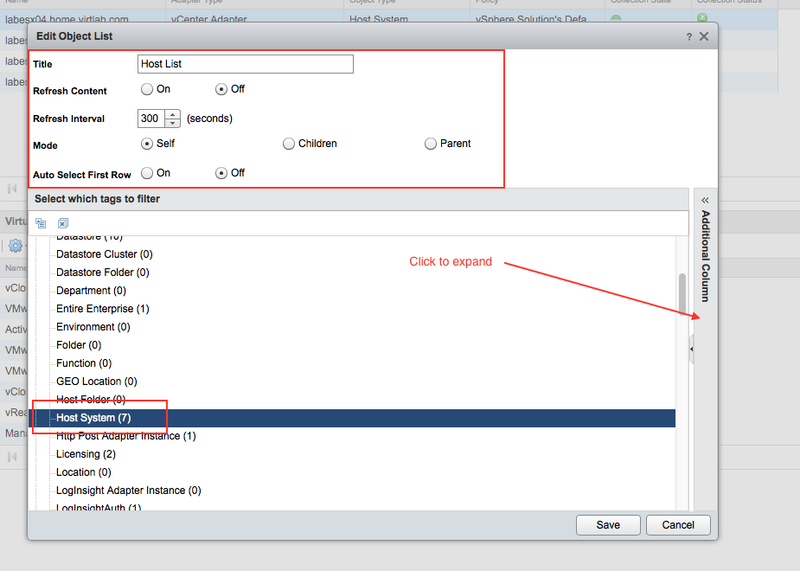 The dashboards come with several columns; I am going to drop down the column menu and remove the adapter type, policy, collection state, and collection status. In my dashboard, this information isn’t providing any relevant value when I am specifically looking at troubleshooting an issue. I do this for both object lists. After we have saved our design, we should have a host list window that displays our vSphere ESX hosts and the particular metrics we selected above. The last item we are going to include in our widget list is Workload; we are going to drag the widget to the bottom of our new dashboard. We should have a dashboard that comprises of a host list, virtual machine list, and a workload visual. We are going to connect our virtual machine widget to our host systems widget. This provides a dynamic view into the environment. When clicking on a host system in the above window frame, it will display the virtual machines associated with the host in the below window. The Widget Interaction screen allows you to select a provider widget for a receiving widget. 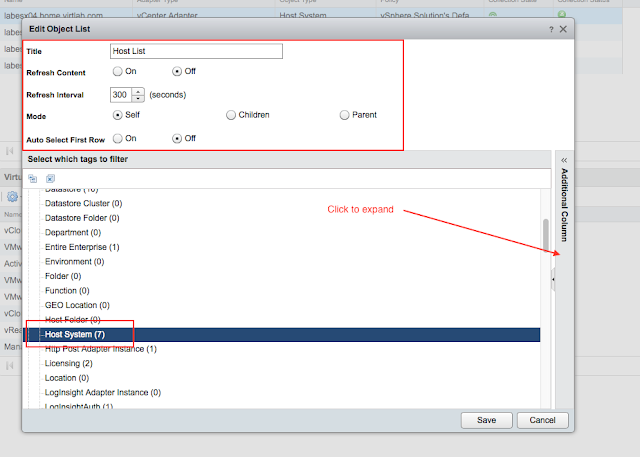 In other words, the receiving widget will only contain the child objects and metrics data for the parent object selected in the Selected Objects. 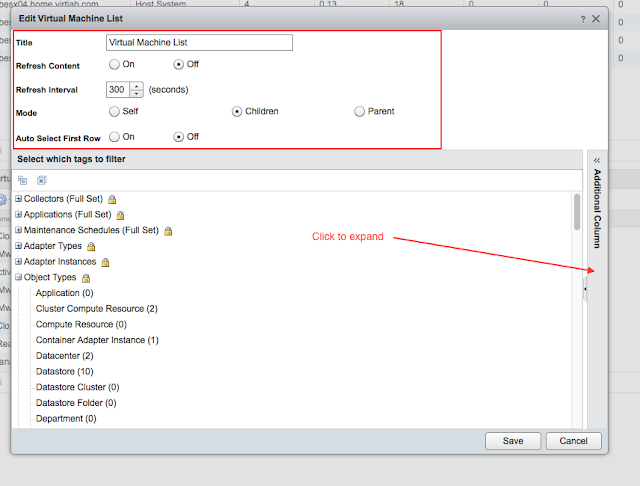 For instance, for our dashboard we are going to pick Host List for the provider of the Virtual Machine List. This has established the connection between the two widgets, now when I select a host system from the top window, only the associated virtual machines with that host show in the bottom window. 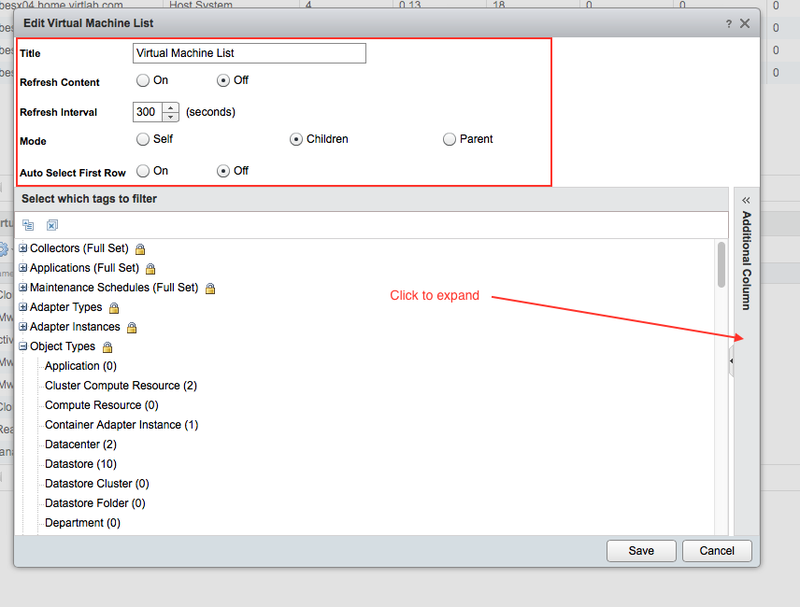 I am also going to form a connection between the Virtual Machine List and Workload. 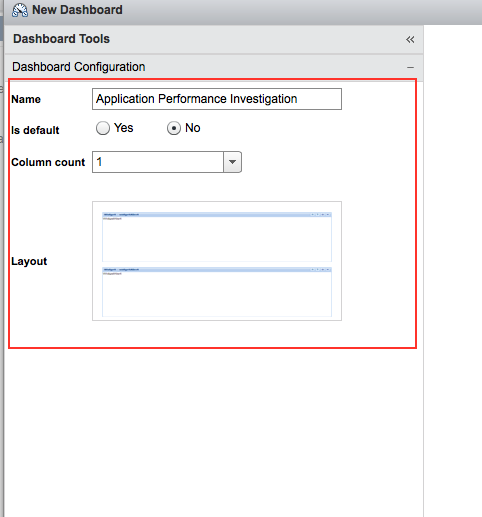 After we save our new Dashboard, it shows up on our home screen with a new dashboard tab called Application Performance Investigation. 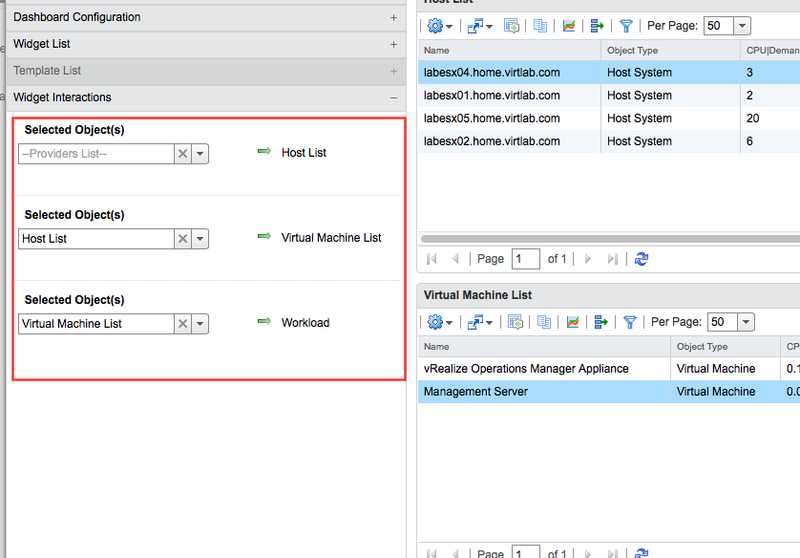 When I click my host server labesx04.home.virtlab.com, it shows the two virtual machines on the vSphere host called vRealize Operations Manager Appliance and Management Server. If I select vRealize Operations Manager Appliance, then it shows me the workload statistics for the virtual machine. 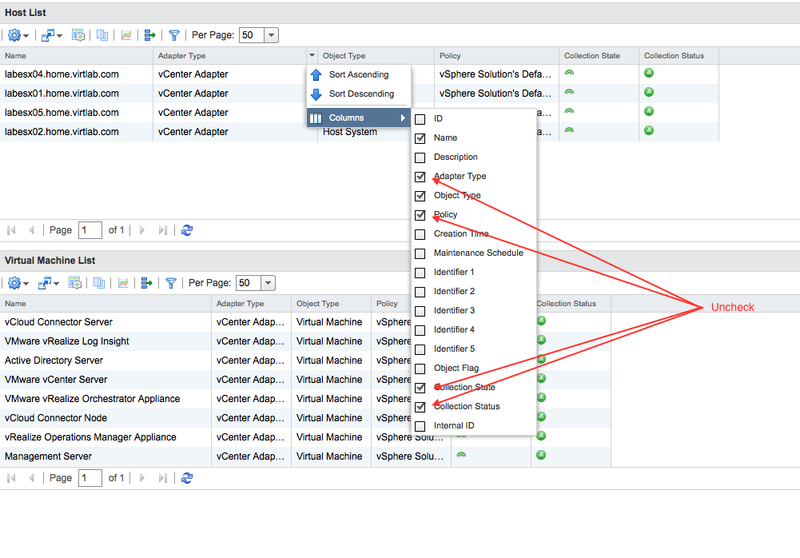 Clearly in the end, you have a comprehensive dashboard that provides a tremendous amount of value by displaying the host metrics you have selected, the virtual machine metrics, and the workload details. This is a great portal to use when you are troubleshooting a specific issue in the environment.